Anne Hathaway’s 15th century cottage at Shakespeare’s Birthplace Trust became the focus of a celebration in the ‘Sounds in the Garden’ project. ‘Sounds in the Garden’ inspired local communities in Shottery and Stratford upon Avon to spend time outdoors, be active and value green space. 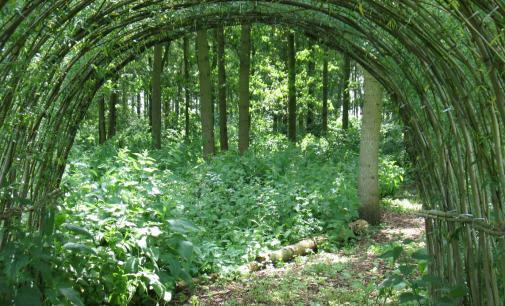 Sounds in the Garden reinvented the woodland, orchards and beautiful garden for local people at an internationally significant heritage site. Communities were engaged through two arts projects, a musical composition by Steel Eye Span to be played on smartphones and MP3 players and a Singing Tree, an interactive touch-sensitive installation with music and poetry. In spring 2013, 50 volunteers planted 7,500 bluebells and 2, 500 snowdrops and hosted a Garden and Allotment Festival which championed the work of 40 local groups, including Transition Town Stratford. Explore Ludic Room’s installation for Sounds in the Garden. The vision for the project was to put SBT at the heart of the community and the community at the heart of the SBT. 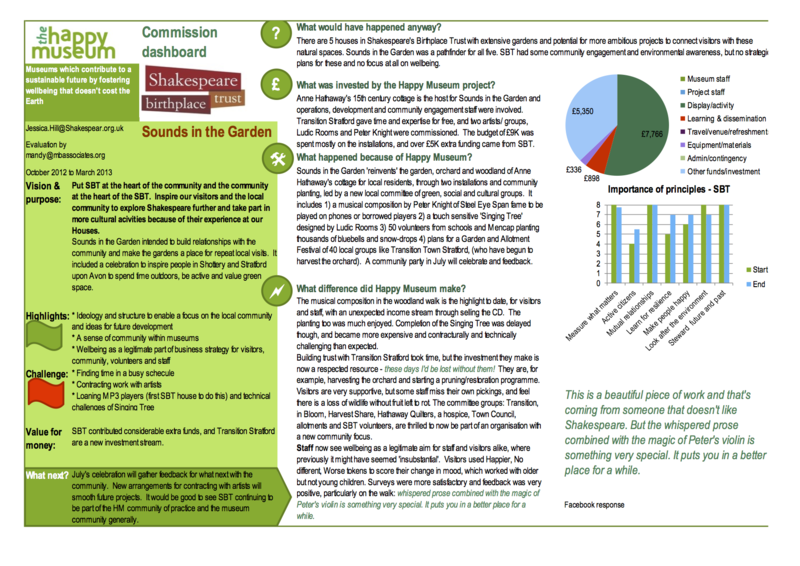 Sounds in the Garden inspired visitors and the local community to explore Shakespeare further and take part in more cultural activities because of their experiences at our Houses. The museum built relationships with the community and made the gardens a place for repeat local visits. Highlights included an ideology and structure which enabled focus on the local community and ideas for future development. A sense of community was gained within the museums and wellbeing became a legitimate part of business strategy for visitors, community, volunteers and staff. Challenges included finding time in a busy schedule, contracting work with artists and there were technical challenges with the loaning of MP3 players and the Singing Tree.